At the start of April we called on you to help us find loving homes for 250 deserving felines before the end of the month. You wasted no time lending a helping hand to our cats and kittens in need! Because of you, 393 cats and kittens are now spending the first days of May in the loving care of their new families. 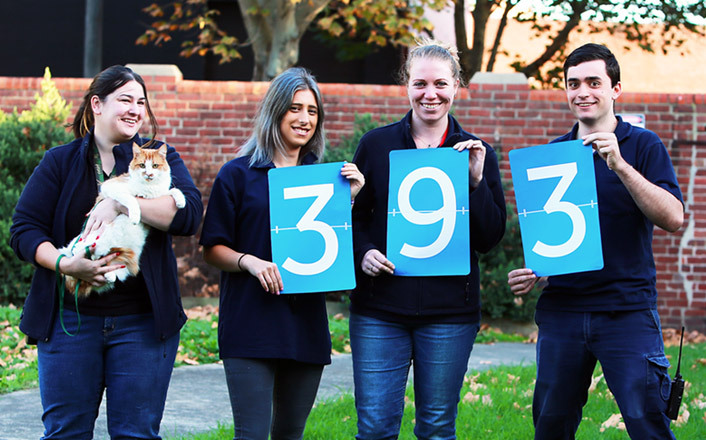 139 cats and 223 kittens were adopted from our North Melbourne shelter, while 20 cats and 11 kittens were adopted from our Campaspe shelter. You shared our Adopt-A-Thon posts 818 times, reaching more than 106,000 Facebook followers! To all the cat lovers who adopted, fostered and advocated during our 2016 Adopt-A-Thon, thank you. Without your passion and support, we wouldn’t have been able to find homes for these cats and kittens in need. Your support has also helped us accommodate for the steady flow of cats and kittens coming into our shelters. So thank you! 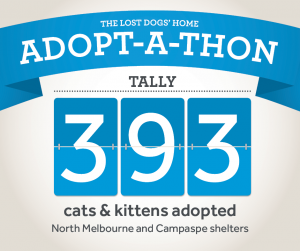 Adopt-A-Thon has wrapped up for 2016, but we still have a number of cats and kittens available for adoption at our North Melbourne and Campaspe shelters. Don’t forget about the power of good ol’ word of mouth! If a cat catches your eye, but can’t adopt yourself, why not share their profile via email or social media? Every little bit helps!